An interesting Read and fodder for thought. High Frequency Trading Programs (HFTP) collect a ¼ of a penny rebate for every transaction they make. They’re not interested in making a gains from a trade, just collecting the rebate. Let’s say an institutional investor has put in an order to buy 15,000 shares of XYZ company between $10.00 and $10.07. The institution’s buy program is designed to make this order without pushing up the stock price, so it buys the shares in chunks of 100 or so (often it also advertises to the index how many shares are left in the order). The HFTP then begins front-running the institutional investor. So the HFTP puts in an order for 100 shares at $10.04. The broker who was selling shares to the institutional investor would obviously rather sell at a higher price (even if it’s just a penny). So the broker sells his shares to the HFTP at $10.04. The HFTP then turns around and sells its shares to the institutional investor for $10.04 (which was the institution’s next price anyway). And this kind of nonsense now comprises 70% OF ALL MARKET TRANSACTIONS. Put another way, the market is now no longer moving based on REAL orders, it’s moving based on a bunch of HFTPs gaming each other and REAL orders to earn fractions of a penny. Currently, roughly five billion shares trade per day. Take away HFTP’s transactions (70%) and you’ve got daily volume of 1.5 billion. That’s roughly the same amount of transactions that occur during Christmas (see the HUGE drop in late December), a time when almost every institution and investor is on vacation. HFTPs were introduced under the auspices of providing liquidity. But the liquidity they provide isn’t REAL. It’s largely microsecond trades between computer programs, not REAL buy/sell orders from someone who has any interest in owning stocks. In fact, HFTPs are not REQUIRED to trade. They’re entirely “for profit” enterprises. And the profits are obscene: $21 billion spread out amongst the 100 or so firms who engage in this (Goldman Sachs (GS) is the undisputed king controlling an estimated 21% of all High Frequency Trading). So IF the market collapses (as it well could when the summer ends and institutional participation returns to the market in full force). HFTPs can simply stop trading, evaporating 70% of the market’s trading volume overnight. Indeed, one could very easily consider HFTPs to be the ULTIMATE market prop as you will soon see. Indeed, volume hasn’t contracted like this since the summer of 1989. For those of you who aren’t history buffs, the S&P 500’s performance in 1989 offers some clues as what to expect this coming fall. In 1989, the S&P 500 staged a huge rally in March, followed by an even stronger rally in July. Throughout this time, volume dried up to a small trickle. 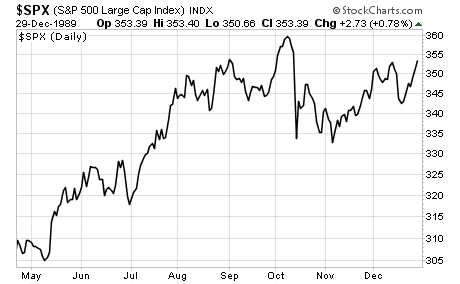 To date, the stock market is up 48% since its March lows. This is truly incredible when you consider the underlying economic picture: normally when the market rallies 40%+ from a bear market low, the economy is already nine months into recovery mode. Indeed, assuming the market is trading based on earnings, the S&P 500 is currently discounting earnings growth of 40-50% for 2010. The odds of that happening are about one in one million. The 50 smallest stocks have outperformed the largest 50 stocks by 7.5%. The 50 most shorted stocks have beaten the 50 least shorted stocks by 8.8%. Consider that the short interest has plunged 72% in the last two months. Those industries that should be falling the most right now due to the world’s economic contraction (energy, materials, etc.) have seen the largest drop in short interest: Energy -90%, Materials -94%, Financials -86%. Yahoo! (YHOO) will cut 675 jobs. Verizon (VZ) just laid off 9,000 employees. Motorola (MOT) plans to lay off 7,000 folks this year. Shell (RDS.A) has laid off 150 management positions (20% of management). Microsoft (MSFT) plans to lay off 5,000 people this year. So unemployment claims are falling, that means people are finding jobs right? Wrong. It means that people are exhausting their unemployment benefits. When you consider that there are 30 million people on food stamps in the US (out of the 200 million that are of working age: 15-64) it’s clear REAL unemployment must be closer to 16%. And they’re slowly running out of their government lifelines. Throw in the other four million who lost their jobs in the first half of 2009 and you’ve got 13 million people (counting families) who will be essentially destitute by year-end. The US consumer is 70% of our GDP. People without jobs don’t spend money. People who are having to work part-time instead of full-time (another nine million) spend less money than full time employees. And people who are forced to work shorter work weeks (current average is 33, an ALL TIME LOW), have less money to spend. So how will corporate profits perform as more and more consumers become part-time, unemployed, or destitute? Well, so far profits have been awful. And that’s BEFORE we start seeing millions of Americans losing their unemployment benefits. With the S&P rallying on these already crap results… what do you think will happen when reality sets in during 3Q09? Few commentators care to mention that the total notional value of derivatives in the financial system is over $1.0 QUADRILLION (that’s 1,000 TRILLIONS). US Commercial banks alone own an unbelievable $202 trillion in derivatives. The top five of them hold 96% of this. 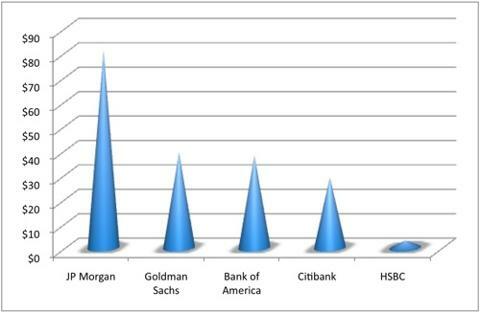 As you can see, Goldman Sachs alone has $39 trillion in derivatives outstanding. That’s an amount equal to more than three times total US GDP. Amazing, but nothing compared to JP Morgan (JPM), which has a whopping $80 TRILLION in derivatives on its balance sheet. What are the odds that Wall Street, when allowed to trade without any regulation, oversight, or audits, put a lot of money at risk? I mean… Wall Street’s track record regarding financial instruments that were ACTUALLY analyzed and rated by credit ratings agencies has so far been stellar. After all, mortgage backed securities, credit default swaps, collateralized debt obligations… those vehicles all turned out great what with the ratings agencies, banks risk management systems, and various other oversight committees reviewing them. I’m sure that derivatives which have absolutely NO oversight, no auditing, no regulation, will ALL be fine. There’s NO WAY that the very same financial institutions that used 30-to-1 leverage or more on regulated balance sheet investments would put $50+ trillion “at risk” (only 5% of the $1 quadrillion notional) when they were trading derivatives. If Wall Street did put $50 trillion at risk… and 10% of that money goes bad (quite a low estimate given defaults on regulated securities) that means $5 trillion in losses: an amount equal to HALF of the total US stock market. This of course assumes that Wall Street only put 5% of its notional value of derivatives at risk… and only 10% of the derivatives “at risk” go bad. Do you think those assumptions are a bit… low?